The Ghost Bike Project is a nationwide effort to increase awareness of the dangers bicyclists face, and to encourage cyclists and drivers to share the road. 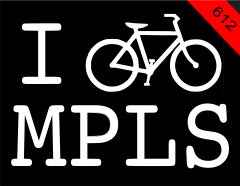 More information can be found at http://www.ghostbikempls.org/. The memorial ride will begin at 1:30 on March 30th, at the east end of the Stone Arch Bridge (MAP). Attendees are encouraged to arrive 30 minutes early. There will be a short ride to the intersection of Quincy and Broadway, followed by the installation of a ghost bike and a moment of silence. Members of the public are welcome to attend. thanks to Sveden for this important news. why abandon a loved one? Go to the front door. Get explicit. Communism at OUR Auto Show!